Federal’s Speed-Shok line is designed to be fast moving and clean burning: perfect attributes for your next duck hunt. Featuring catalyst lead-free primers and clean burning powders, these rounds keep you in the field longer and mean less cleaning for you at the end of the day. The Speed-Shok line is optimized to be quick, for better knockdown power against ducks and geese. 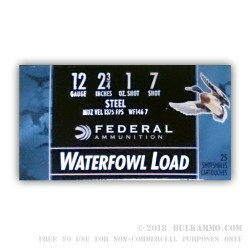 These 12-gauge shotgun shells feature 1 oz. of #7 steel shot, loaded into a 2¾” shotgun shell. They are also great hunting rounds for areas where lead shot is prohibited or where water contamination and pollution is an issue. These shells are capable of a muzzle velocity of 1375 FPS and are a great tool to fill your bag with birds this season. Each box contains 25 shotgun shells from Federal, with 10 boxes in each case. Famous for their Federal Premium brand of ammunition, Federal continues to be at the forefront of ammunition technology and produces some of the most dependable ammunition available out of their Anoka, Minnesota manufacturing facility.